Introducing my new bike! This time it is not a folding bike, but a road bike. I have never really considered getting a road bike before, as I don't really see myself going for speed on a bike. However, bike poison is hard to resist! After seeing some people around me getting new road bikes, I have decided to get one for myself to try it out. 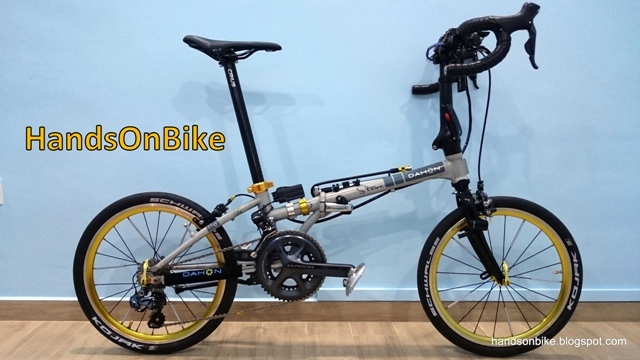 It would be interesting to ride a road bike to see how different it feels from riding a folding bike. Although my Dahon Boardwalk is set up like a road bike, with drop bars and a Di2 road drivetrain, I'm sure it rides quite differently from a real full sized road bike. My objective for a road bike is not for racing, but more for fast casual riding. I wanted to see if riding a road bike will really give a speed boost compared to riding a folding bike, or is it ultimately down to solely the engine of the rider. With that in mind, I started my search for a road bike! Since I wasn't going for a race, I did not consider getting high end road bikes that cost more. High end brands such as Pinarello, Specialized or Colnago are not within my budget or consideration due to the price. Besides, I feel that it is a waste if a high quality racing road bike is used by me for mere casual riding or commuting purposes. Not that it is wrong, just that it will be a pity if I cannot fully exploit the potential of these high end bikes. On the other hand, I do want to get a bike that has relatively high end components, with modern designs and technology used. In this case Dura-Ace is too high end and expensive, which is why I looked around for a road bike with an Ultegra groupset. 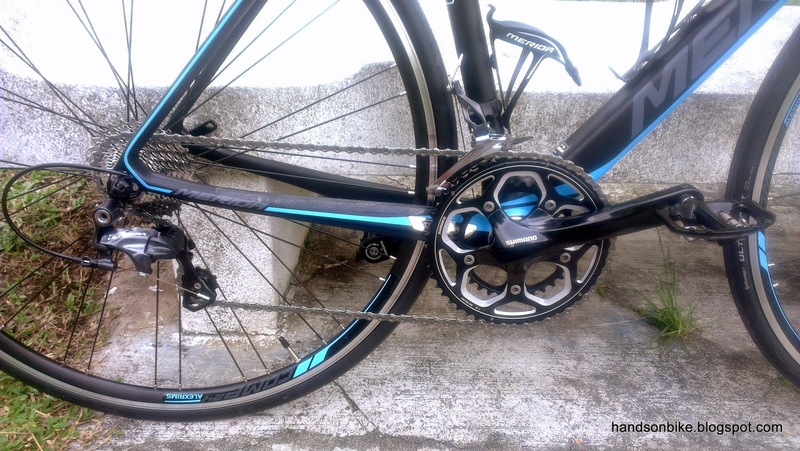 It has to be the new 11 speed Ultegra 6800 groupset, with significant improvements over the previous 10 speed 6700 series. Most importantly, the bike must have a frame and colour design that I like! 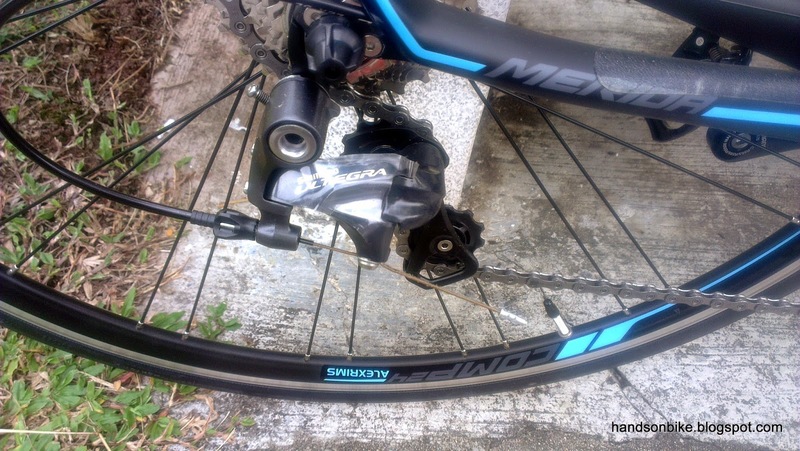 Components and bike parts can be changed, but the bike frame cannot be changed easily. Thus it is important to choose a frame design that you like. This way, you will not have any regrets after buying the bike. I did consider getting a bare bike frame and building the whole bike from scratch, but it does not really make sense financially, as it will cost more than actually buying a complete bike from the shop. The second best thing I can do is to find a bike that has most of the components that I want, to minimise the number of components that I will change. For a mid range road bike that is friendly on the wallet, a few brands come to my mind. Giant, Merida, Scott and Polygon. These are some of the more well-known brands in Singapore for offering good quality bikes at a reasonable price. 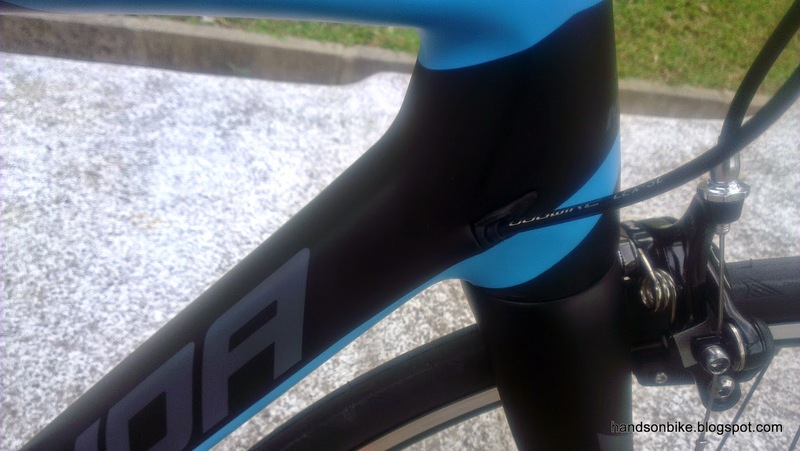 A decent road bike starts at a price of around SGD 1000, with Tiagra or Sora components. For around $1500, it is possible to get a nice aluminium road bike from Polygon or Merida that has a Shimano 105 groupset. 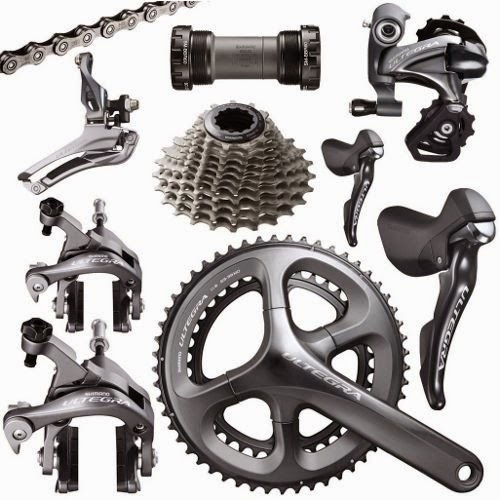 Above $1500, Ultegra groupsets are available on aluminium frames, or Shimano 105 groupsets on carbon frames. I found that for a given price, you can either get an aluminium frame with Ultegra parts, or carbon frame with Shimano 105 parts. 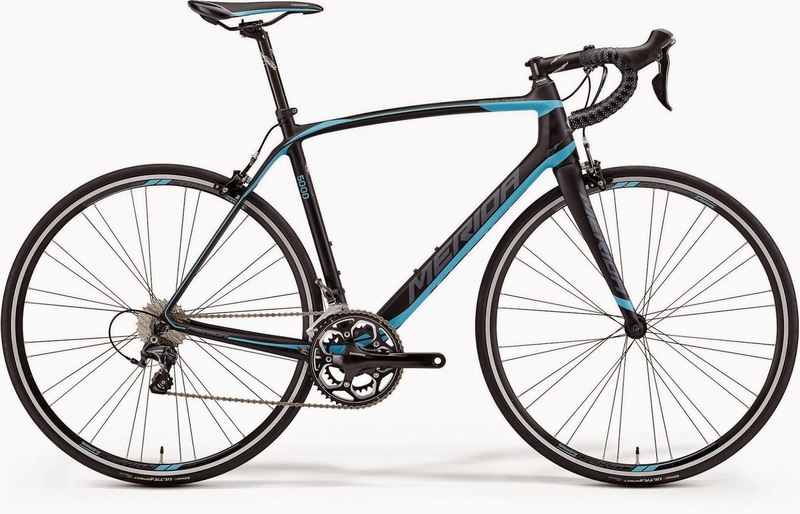 $2000 and above gets you carbon framed bikes with Ultegra groupsets. That is the price range I am looking at for my first road bike. Polygon has the best priced bikes, however the new 11 speed groupsets are not available yet at the shops. However, they are clearing the older 10 speed road bikes at a great price, so it is a really good time to get 2x10 speed road bikes at a bargain price. Same for Scott bikes, where the bikes available are mostly 10 speed bikes. Giant does have the newer 11 speed Ultegra and 11 speed Shimano 105 groupsets on some of the newer bikes. However, I did not really like the design of the frames and so did not find anything I liked at Giant. The pricing is also higher than other brands of bikes with similar specifications. 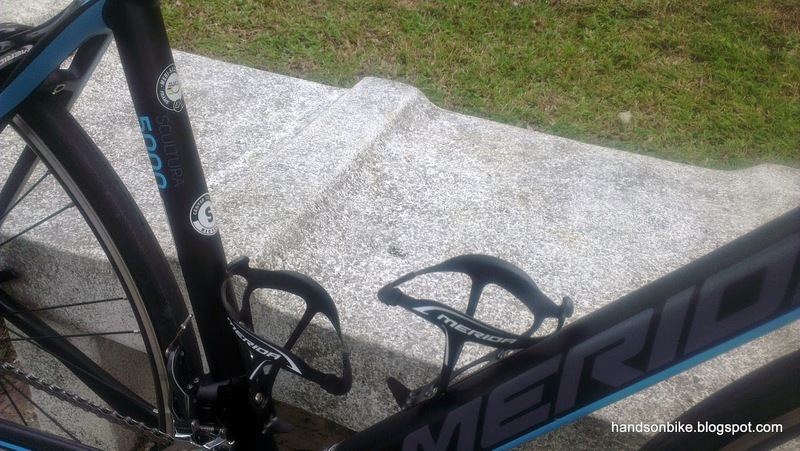 Finally, I came across Merida road bikes. For the 2015 model bikes, the new designs look pretty good. 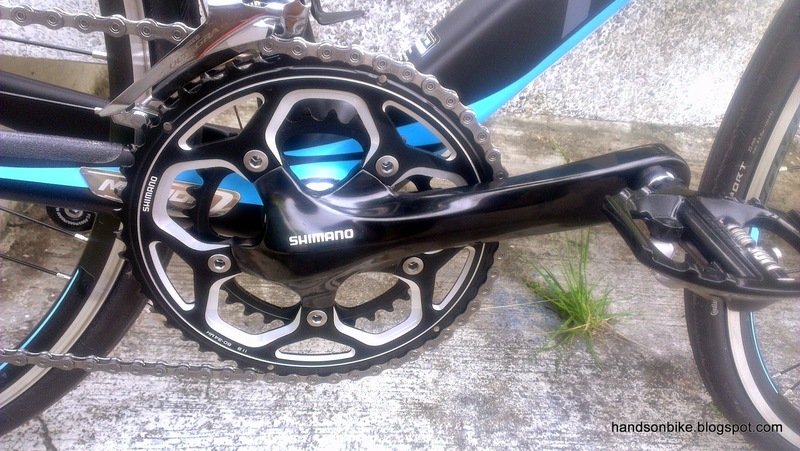 Also, they mostly come with Shimano 11 speed groupsets which is what I am looking for. Eventually it was down to selecting the right frame with the right components. 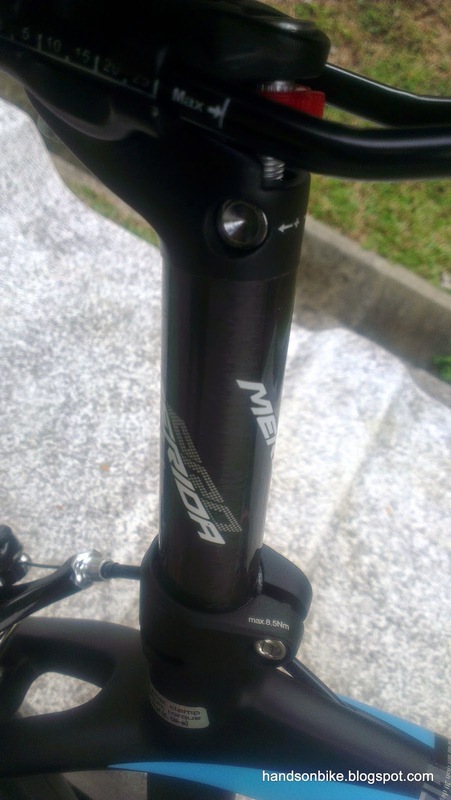 I finally settled for the Merida Scultura 5000 which is the closest to my expectations. 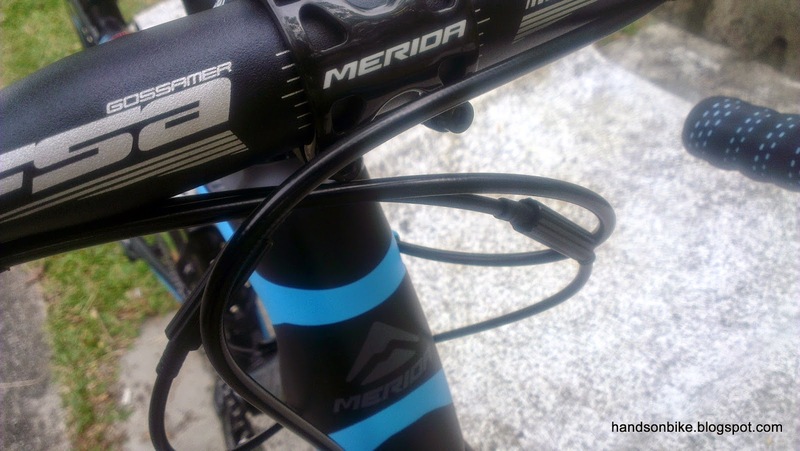 Merida Scultura 5000, in blue and black colour. Picture from the Merida website. 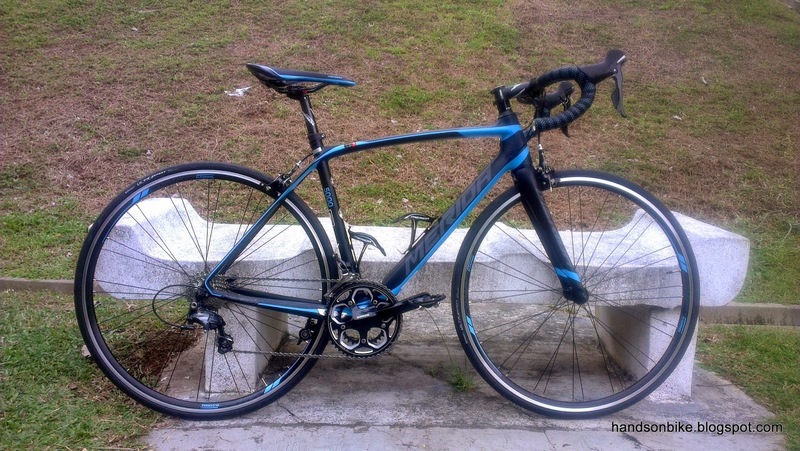 I bought my road bike from Hup Leong, which gave exceptionally well service. With some arrangement from Gilbert, I managed to get the Scultura 5000 in the correct size and colour which I wanted within one week! The bike was also ready to ride when I arrived to collect the bike, except for some minor adjustments. Let's start with the heart of the bike, which is the drivetrain. 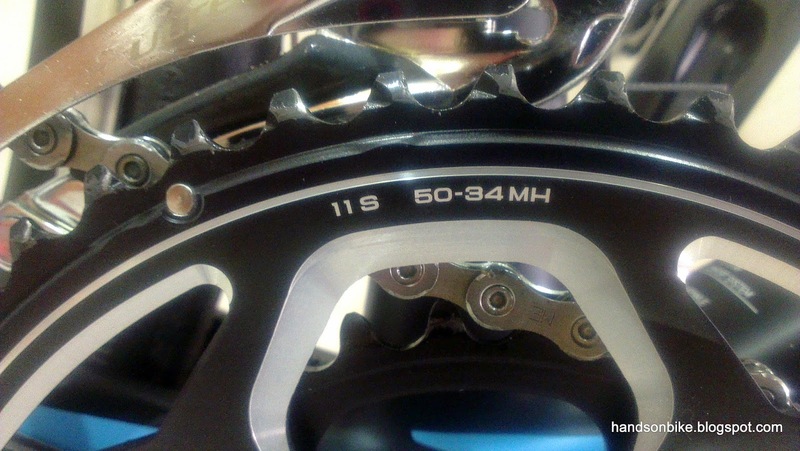 Non-series 11 speed crankset. 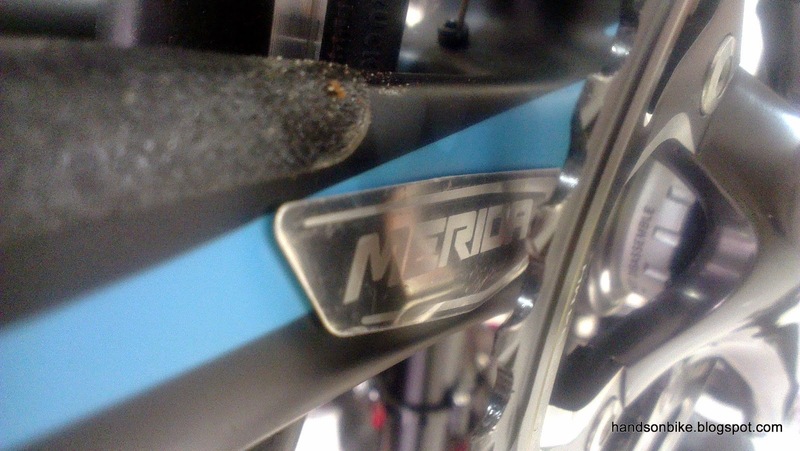 Here is where Merida was able to lower the price by specifying a non series crank instead of the Ultegra 6800 crankset. 50/34 compact crankset. Suitable for most riders as the gear range would be more than sufficient. 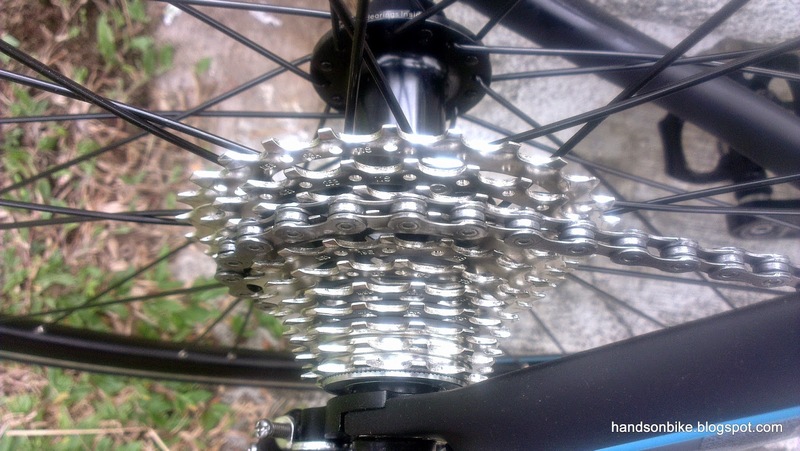 A standard 53/39 crankset would have a gear ratio that is too high, and I would not be able to use the higher gears. Non series Hollowtech II road BB is used. Ultegra 6800 11 speed rear derailleur. 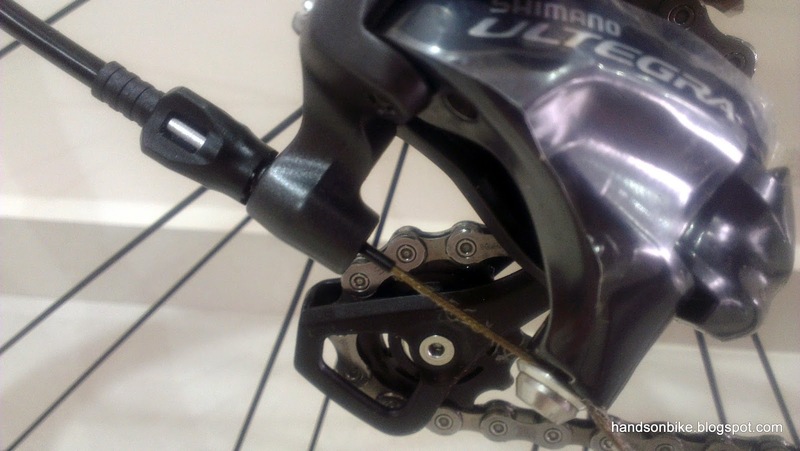 The new front derailleur from the Ultegra 6800 series is also used. The long arm on the FD outer link ensures light front shifting that is much improved from the previous version. 11 speeds on that cassette! 11-28T cassette for all purpose riding. From the bike specifications it is actually from the 11 speed 105 5800 series, and not Ultegra grade. No big deal though as the difference is only in weight, or is it? 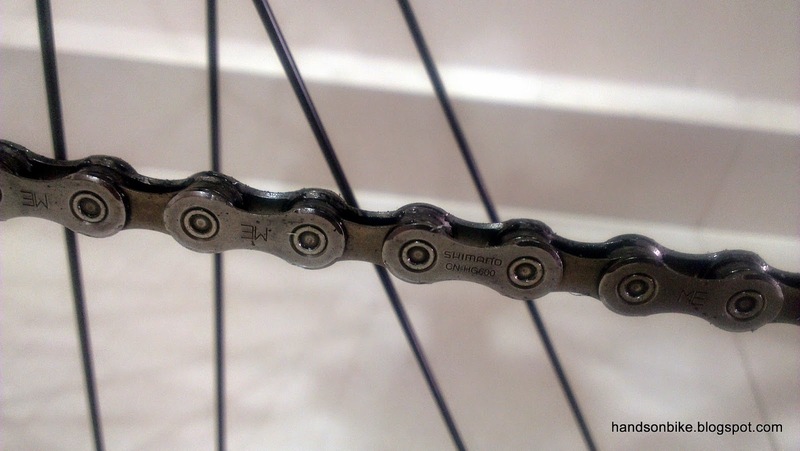 Shimano 11 speed chain CN-HG600. 105 grade 11 speed chain. Another component which is downgraded to save costs. 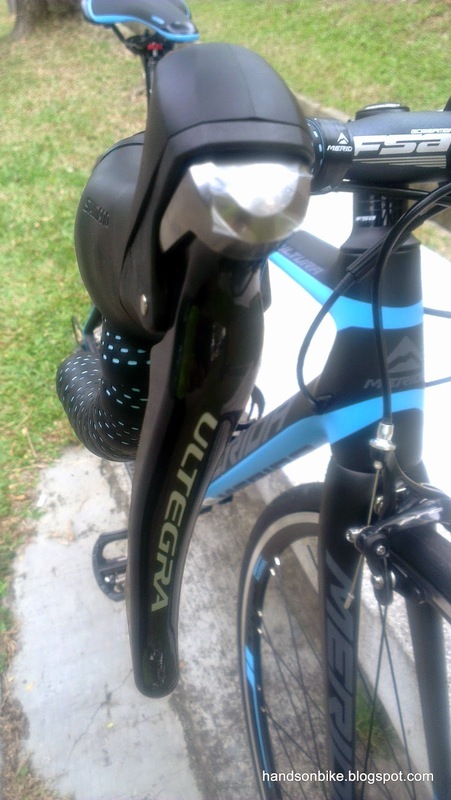 Ultegra 6800 11 speed shifters. The bar tape colours are nicely matched with the frame colours. New 11 speed shifters with carbon composite shifting levers. Smaller hood improves the gripping ergonomics compared to the previous generation of internal routing shifters. 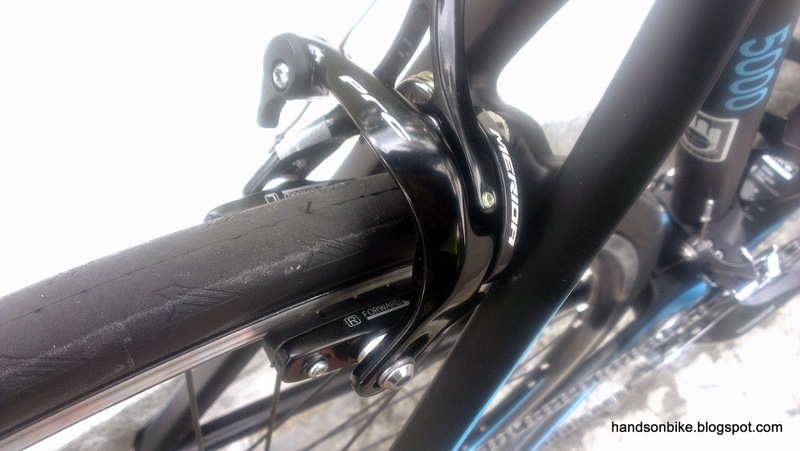 Merida's own brake calipers are used to lower the costs. In the background the new pedals can be seen. These are the A530 dual sided pedals that I like. 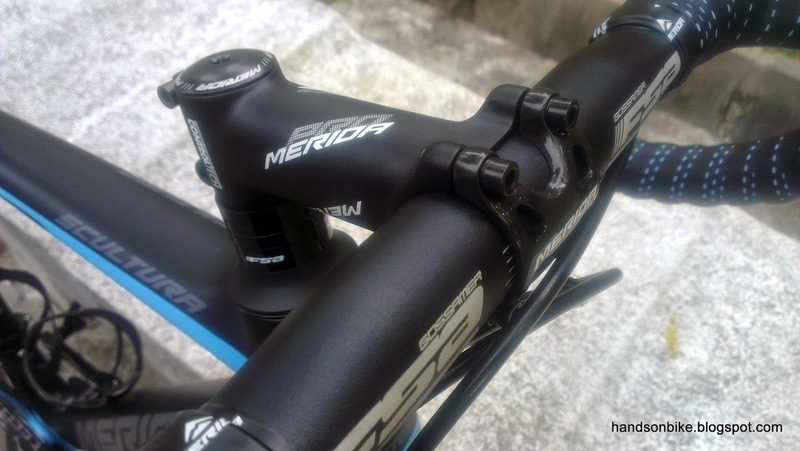 Carbon face plate is used on the aluminium Merida stem, which is rather unusual. 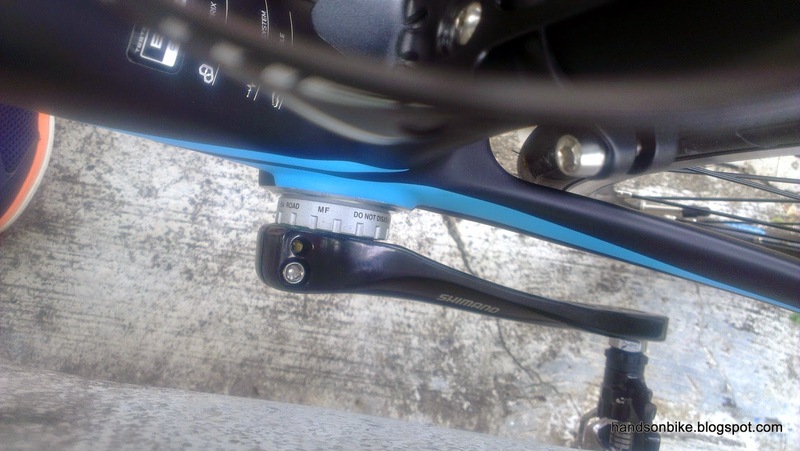 Overall view of the handlebar and shifters. 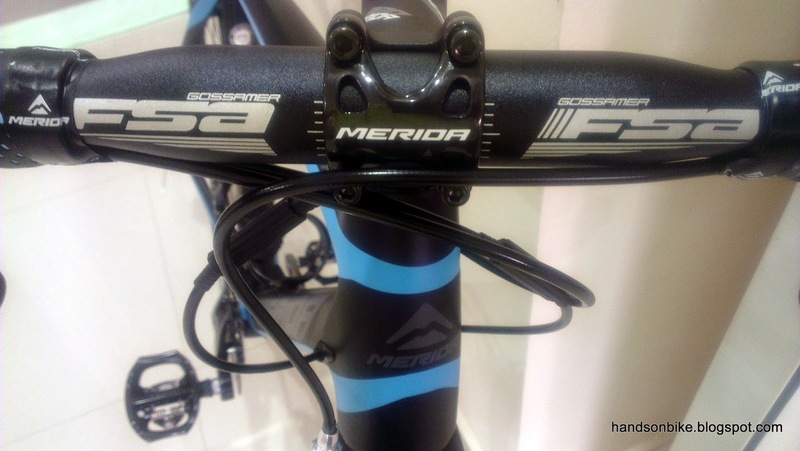 Merida's own carbon seatpost. I have not taken a closer look at it so I am not sure of the quality yet. 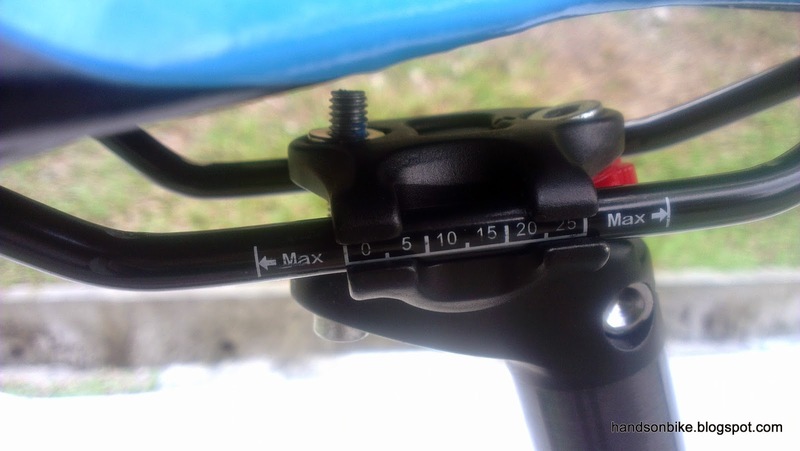 Simple and easy to use adjustment system that allows a great range of saddle settings. Standard wheelset with matching blue trimmings to match the frame. Continental Ultra Sport tires are used for this bike. Internal cable routing is used on this carbon frame. When I eventually have to change the cables, I will find out if it is easy or tricky to change the cables on this internal routing frame. 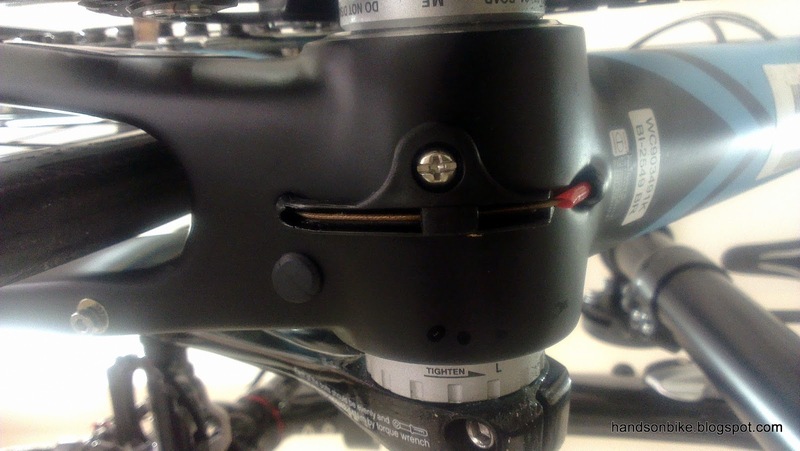 Barrel adjusters are already installed on the cable housings, making it easy to adjust the cable tension even while riding (although it will rarely be used). Inner cable for the FD takes a rather interesting path. It exits the frame near the bottom bracket, goes around the underside of the bottom bracket and then goes through the chainstay junction before going to the FD. 2 water bottle mounts are provided. Free bottle cages courtesy of Hup Leong. By the way this is an S sized bike. 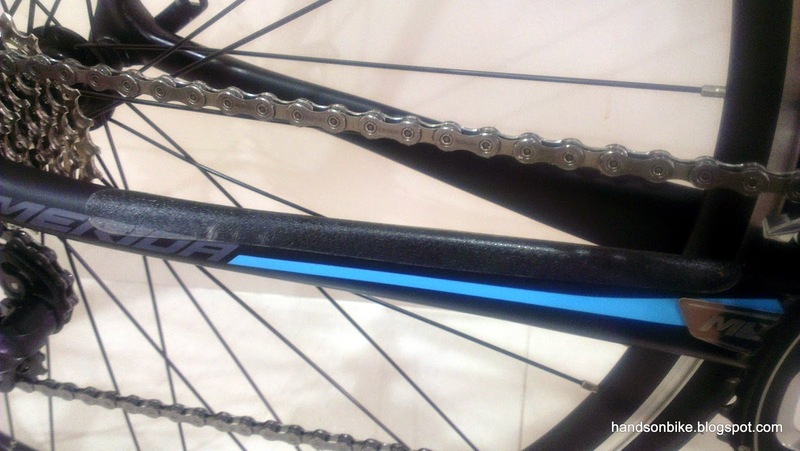 A metal plate on the right chainstay, under the inner chainring protects the frame against damage if there is chain drop. Finally, a picture of the full bike in stock condition! The weight of this carbon frame road bike is 8.6 kg inclusive of the PD-A530 pedals, and 8.2 kg without pedals. The weight of the bottle cages have been deducted from the total weight. This is slightly heavy for a carbon road bike at this price point. 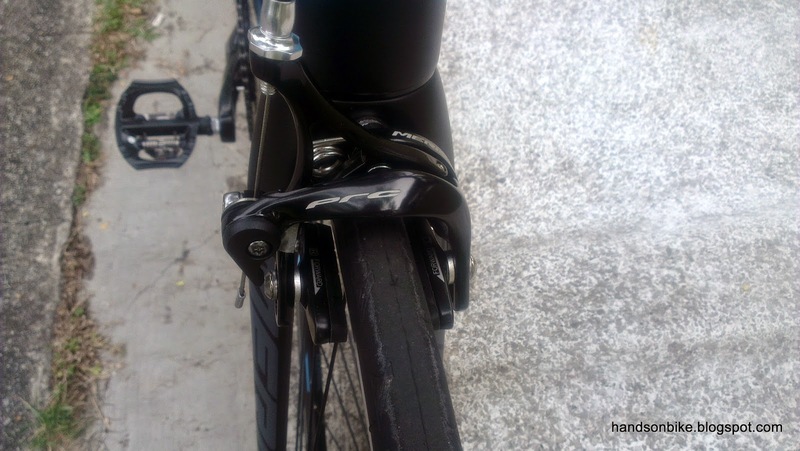 However, I believe that it will be possible to drop the weight to closer to 8 kg (inclusive of pedals) with some upgrades. So far I have done only one ride on the bike, which is to ride it home from Hup Leong. Therefore it would be too early for me to comment on the ride quality of this new road bike. All components on the bike are currently stock components, but you can be sure that I will be upgrading some of the components! What I really like about this bike is the colour scheme. It is mainly stealth black accented with some stripes of blue. It even has matching colours on the saddle, bar tape and wheelset. The size of the bike also feels just right, and I feel comfortable on it. I will be tweaking some settings on the bike as I ride more. As of now, this is all I can say about the bike as I have not put enough mileage on it. But for first impressions, this seems like a pretty nice bike that I would keep wanting to ride. If you can nail the sizing for the bike, it's an awesome ride. Well I wouldn't say 8.7kg is "rather heavy". 8.7kg is a very decent weight for a bike out of the box at this price point(considering the part spec). 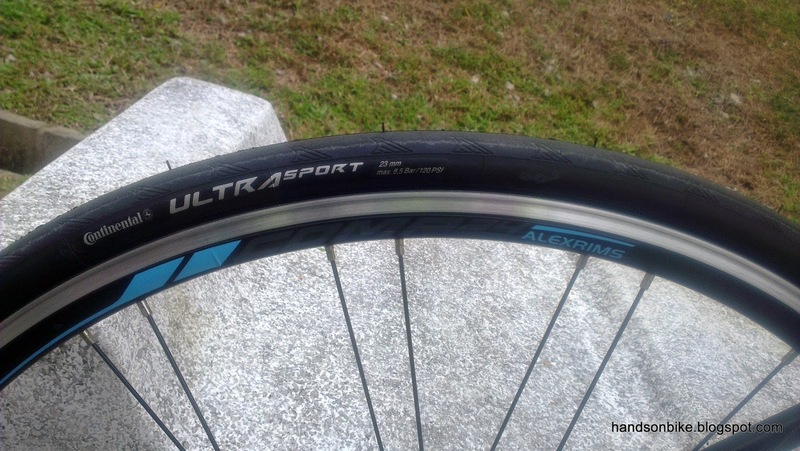 Ditching the heavy stock wheelset to a light weight aluminium wheelset (about 30mm) can shave you 300-400g. 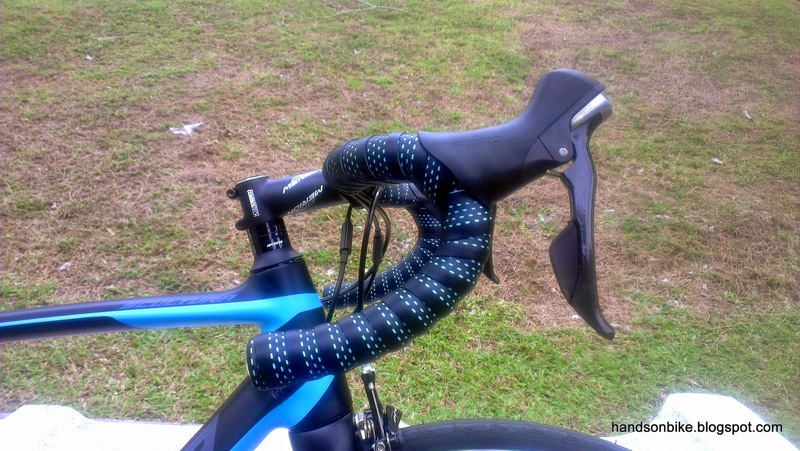 Not to mention the bar, stem, saddle that are notoriously heavy, which can be swapped out cheap to slightly better and lighter aluminium ones. Thanks for the tips! I am actually waiting for new wheels, will do a weight comparison once those wheels arrive. Not sure about the weight difference though. I'm not sure how the internal cabling runs through the frame. 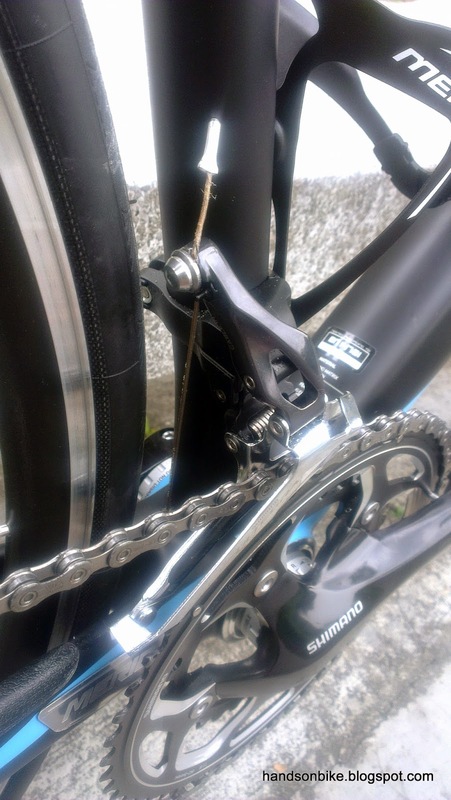 But I believe that this is probably the best route, and that you will need to remove the bb to thread the RD cable through the chain stay. Interesting review. I thought I read that the size was S which is a 50cms. You say it feels right, can I ask what height you are? I'm 168cm tall, with inseam length of about 77cm. 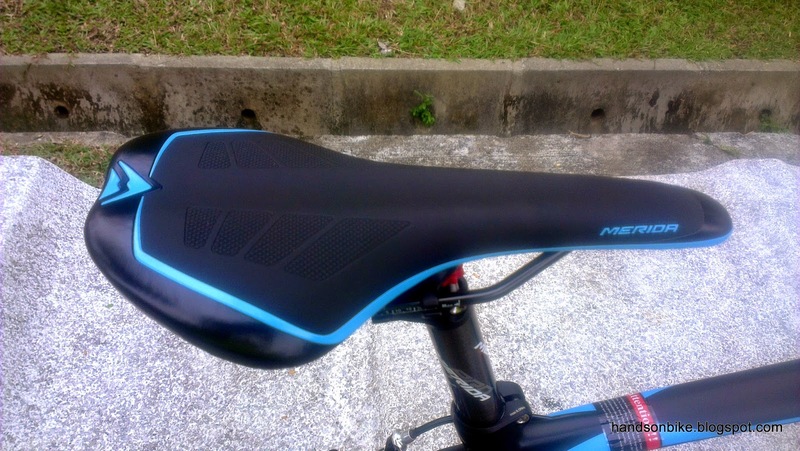 For Merida road bikes, a 50cm is an S size. This differs across different bike frame makers. Did you ever get the chance to weight the wheels when you did your stripdown of the bike? Yupz more details at the other post here. just want to check what band of bar tape you used? pretty neat!! 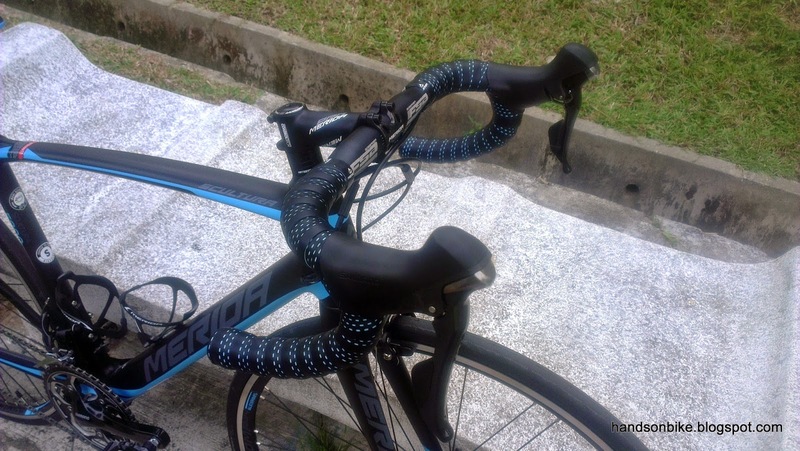 I like this bar tape too. It comes stock with the bike, and i don't know what brand it is. Hi there, may i know how much u paid for this? Looking at this and the ride 5000 which i cant seem to find in Sg. 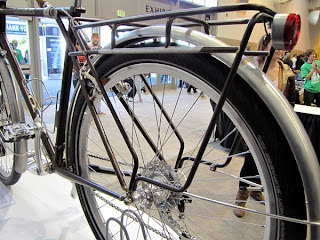 Also looking at polygon bikes. Looking at those classed as "endurance", road bike with a little more comfort type. This bike is SGD 23XX at stock conditions. The distributor did not bring in the model Ride 5000 which I was also considering. Any chance of a review of the bike in action? Sure, if you have any comments you can just add them here.